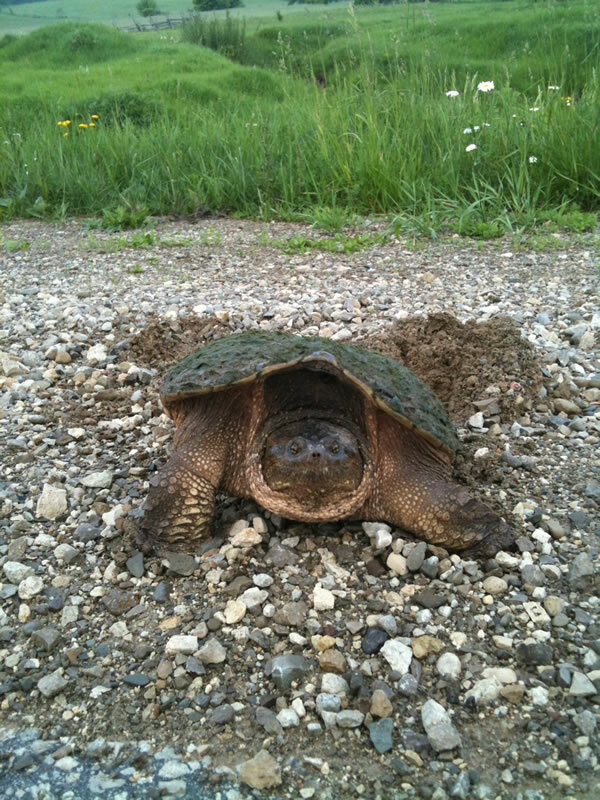 Until recently, many of us expected to see in June a snapping turtle laying her clutch of maybe 40 eggs at the roadside. Certainly this has been the case near the Beaver River, where female turtles come up from the river and make their way onto the gravel. It is easy to then see how impressive is Canada’s largest freshwater turtle, Chelydra serpentina. Tragically, 40 million years of success may be coming to an end. The odds are slim that a baby snapping turtle will reach maturity (at 15–20 years). It is estimated that only 1 in 1,400 eggs achieves this. There are many predators that dig up the eggs. However, it is we who have brought the snapping turtle and other reptiles to the edge of extinction. The David Suzuki Foundation has warned Ontario’s Ministry of Natural Resources that it must ban all hunting of snapping turtles, as Quebec and Nova Scotia have, and apply the precautionary principle to its conservation work. (See ‘Road to Extinction’ at davidsuzuki.org) As of today, anyone with a small game or fishing licence can take two snapping turtles each day. Although commercial harvesting of turtles is illegal, the dwindling snapping turtle population needs much better protection than simply being listed “of special concern” under Ontario’s Endangered Species Act. Sporting groups have denied that there is a problem, but most scientists disagree, including those who conducted a 40-year study for Ontario’s Species at Risk programme. If the complex toxic mix of habitat loss, boat strikes, road kill, bio-toxic pollution, climate change and the black market is put into a meaningful conservation perspective, we all have to do much better if the snapping turtle is to be saved. Undoubtably snapping turtles are an important part of their aquatic ecosystem. They like muddy river bottoms and move along them making channels for other creatures to live in. They eat dead fish and mammals as well. 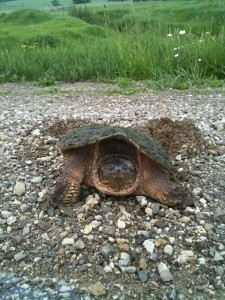 What can you do to help the snapping turtle? Definitely take her off the road and move her in the direction she was going. If you see a turtle laying her eggs, stay near to protect her until she has covered them up, and return her to the wetland. (By the way, it is a myth that she can cut your finger off if she bites you.) If you find an injured turtle, contact Kawartha Turtle Trauma Centre at 705 741 5000. The failure of the world’s richest countries to live up to their climate pledges in the wake of the disaster in the Philippines has only created a wider divide between rich and poor. Meanwhile, the decision by 800 people representing trade unions, environmental groups, young people and social organizations to walk out of the Warsaw Conference left the UN meeting at a new low. The summit’s final communiqué speaks of success that will lead us to a fruitful agreement in Paris in 2015 – but where is the map to get us there? Canada has the dubious distinction of receiving the only “Lifetime Unachievement Award” for its continuing role in blocking and stalling progress at the talks. Canada has become the mouthpiece of many large companies. Following new research in the journal Climatic Change The Guardian newspaper said: “The climate crisis of the 21st century has been caused largely by just 90 companies, which between them produced nearly two-thirds of the greenhouse gas emissions generated since the dawning of the industrial age”. In the Blue Mountains and Collingwood, what progress has been made in confronting the climate crisis? Although local governments speak about their interest in mending their prodigal ways, little has been accomplished. It is up to young people to make the changes that older people have not been able to achieve in order to beat back devastating climate instability.